From the “Don’t Stop Me Now” zombie beatdown of Shaun of the Dead to the battle of the bands sequence in Scott Pilgrim vs. The World, music has always played an integral part in helping Edgar Wright distinguish his cheeky and kinetic style apart from his peers. 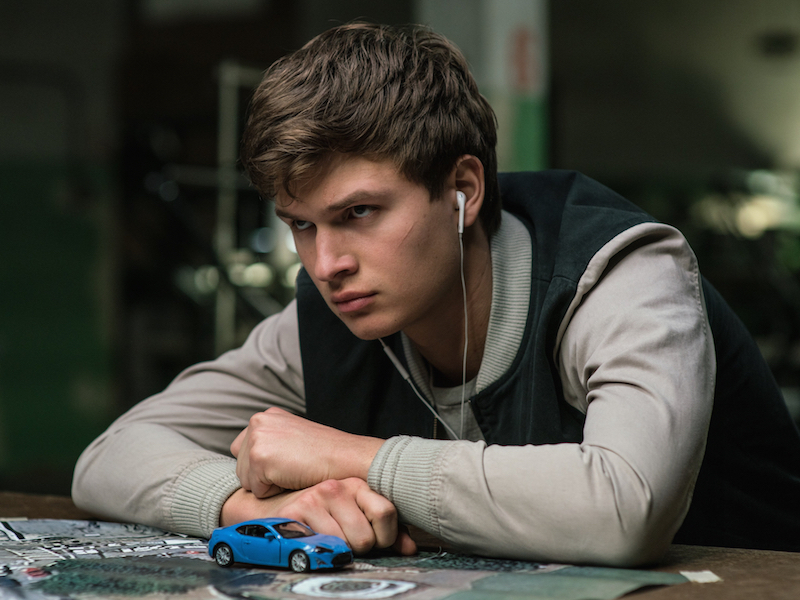 His new film Baby Driver takes the concept of an integrated soundtrack further and doesn’t just underline the big scenes with memorable musical cues but orchestrates the majority of its action along with the beats of the selected songs to create an impeccably synchronized experience. It’s not quite a musical, at least in the traditional sense since characters aren’t belting out lyrics that correspond with the songs that are being playing, but everything plays out with such a deliberate rhythm that the driving force of the music almost acts as the main character of the movie. In a more literal sense, the story centers around a young getaway driver (Angel Elgort) with the code name Baby who escorts bank robbers under the supervision of the kingpin Doc (Kevin Spacey), who Baby crossed paths with early on in his life and has remained indebted to ever since. Seeking to get out of the crime life once and for all, he agrees to do a final job stealing money orders from the Post Office with the violently impulsive Bats (Jamie Foxx) and the quietly intense Buddy (Jon Hamm) in order to square his arrangement with Doc. Prior to the heist, Baby meets a diner waitress named Debora (Lily James) with whom he instantly falls in love and sees as a perfect companion for his pending getaway provided everything goes smoothly with the final robbery. We’re told early on that Baby suffers from tinnitus, which he assuages by connecting his ever-present earbuds to a menagerie of vintage iPods and keeps his music going constantly in the background, even during conversations with others and during plotting sessions where Doc breaks down each step of an upcoming stickup. More often than not, we’re treated to the effect that Baby is essentially sharing one of his earbuds with the audience, as we are also hearing the eclectic playlists that are going through his head at the same time he is. This leads to fun choreographed moments big and small, from an opening chase sequence designed shot for shot around The Jon Spencer Blues Explosion’s rousing “Bellbottoms” to something as simple as setting down a set of coffee cups along with the tempo of song. When it moves to the music, Baby Driver is as exuberant and satisfying as anything that Wright has done up to this point but the movie occasionally getting bogged down in the more conventional elements of its storytelling and loses some of its charm and cleverness along the way. It revels in tropes of the crime genre (“one last job” and a new love that leads to salvation, for instance) that it seems like Wright should be either lampooning or delivering with some kind of a quirky twist but he presents them about as straight-faced as possible. It’s fortunate that he still has a knack for writing snappy dialogue; it’s just a shame that he couldn’t have put more thought behind giving the characters unexpected things to do in addition to giving them unexpected things to say as well. Even with a more routine plot at its center, the mashup of mayhem and music is the biggest selling point of the movie and the precision with which Wright executes these sequences is more than enough reason to sit in the passenger’s seat for this wild ride. Two big standouts for me personally are a heist gone wrong set to The Damned’s “Neat Neat Neat”, which Baby actually rewinds at one point just to ensure that the action will match up with the music, and a frantic footrace set to Focus’ indefatigable yodel anthem “Hocus Pocus”. If the Ant-Man dispute with Marvel put Edgar Wright’s career in a bit of a temporary stall, Baby Driver has put him firmly back on the right track and in the fast lane towards more mainstream success.